10 round stripper clip,internal box magazine. Hooded post front sight, tangent notch rear sight graduated from 100 to 1,000 meters. The SKS is a Soviet semi-automatic carbine chambered for the 7.62×39mm round, designed in 1943 by Sergei Gavrilovich Simonov. Its complete designation, SKS-45, is an initialism for Samozaryadny Karabin sistemy Simonova, 1945 (Russian: Самозарядный карабин системы Симонова, 1945; Self-loading Carbine of (the) Simonov system, 1945). The SKS-45 was manufactured at Tula Arsenal from 1949 to 1958 and at Izhevsk Arsenal in just 1953 and 1954, resulting in a total Soviet production of about 2.7 million carbines. In the early 1950s, the Soviets took the SKS carbine out of front-line service and replaced it with the AK-47; however, the SKS remained in second-line service for decades. It is still used as a ceremonial firearm today. The SKS was widely exported, and was also licensed for production by then Eastern Bloc nations, Romania and East Germany, as well as China, where it was designated the “Type 56 Carbine”. The East German version was known as the Karabiner S, the Albanian as the Model 561 and North Korean as the “Type 63”. The SKS is popular on the civilian surplus market as a hunting and marksmanship semi-automatic rifle in many countries, including the United States, Canada, and New Zealand. Its age and numbers make it relatively inexpensive to purchase, and steel cased 7.62×39mm ammunition is one of the least expensive center fire cartridges currently on the market. The SKS was the second firearm to be chambered for the 7.62×39mm M43 round, with the first being the RPD. SKS with the magazine closed (top) and open. The magazine release is circled. Soviet AK-47 without magazine (top), and a Simonov SKS (bottom) with bayonet folded back, both 7.62×39mm. A field-stripped SKS carbine (disassembled into major components for cleaning). The SKS has a conventional layout, with a wooden stock and rifle grip. It is a gas-operated rifle that has a spring-loaded bolt carrier and a gas piston rod that work to unlock and cycle the action via gas pressure exerting pressure against them. The bolt is locked to contain the pressure of ignition at the moment of firing by tilting downwards at its rear and being held by a lug pressed into the receiver. At the moment of firing, the bolt carrier is pushed rearwards, which causes it to lift the bolt, unlocking it, and allowing it to be carried rearwards against a spring. This allows the fired case to be ejected and a new round from the magazine to be carried into the chamber. The SKS represents an intermediate step in the process towards the development of true assault rifles, being shorter and less powerful than the semi-automatic rifles that preceded it, such as the Soviet SVT-40, but being longer (10 cm or 4in) than AK-series rifles which replaced it. As a result, it has a slightly higher muzzle velocity than those arms that replaced it. While early (1949–50) Soviet models had spring-loaded firing pins, which held the pin away from cartridge primers until struck by the action’s hammer, most variants of the SKS have a free floating firing pin within the bolt. Because of this design, care must be taken during cleaning (especially after long storage packed in Cosmoline) to ensure that the firing pin can freely move and does not stick in the forward position within the bolt. SKS firing pins that are stuck in the forward position have been known to cause accidental “slamfires” (the rifle firing on its own, without pulling the trigger and often without being fully locked). This behavior is less likely with the hard primer military-spec ammo for which the SKS was designed, but as with any rifle, users should properly maintain their firearms. For collectors, slamfires are more likely when the bolt still has remnants of Cosmolineembedded in it that retard firing pin movement. As it is triangular in cross section with only one way to properly insert it (notches up), slamfires can also result if the firing pin is inserted in one of the other two orientations. In most variants (Yugoslav models being the most notable exception), the barrel is chrome-lined for increased wear and heat tolerance from sustained fire and to resist corrosion from chlorate-primed corrosive ammunition, as well as to facilitate cleaning. Chrome bore lining is common in military rifles. Although it can diminish accuracy, its effect on practical accuracy in a rifle of this type is limited. The front sight has a hooded post. The rear sight is an open notch type which is adjustable for elevation from 100 to 1,000 metres (110 to 1,090 yd). There is also an all-purpose “battle” setting on the sight ladder (marked “П”, for “Прямой выстрел”, meaning “Straight shot”), set for 300 metres (330 yards). This is attained by moving the elevation slide to the rear of the ladder as far as it will go. The Yugoslav M59/66A1 has folddown luminous sights for use when firing under poor light conditions, while the older M59 and M59/66 do not. All military SKSs have a bayonet attached to the underside of the barrel, which is extended and retracted via a spring-loaded hinge. Both blade and spike bayonets were produced. Spike bayonets were used on the 1949 Tula Russian SKS-45, the Chinese Type 56 from mid 1964 onward, and the Albanian Model 561. The Yugoslavian-made M59/66 and M59/66A1 variants are the only SKS models with an integral grenade launching attachment. The SKS is easily field stripped and reassembled without specialized tools and the trigger group and magazine can be removed with an unfired cartridge, or with the receiver cover. The rifle has a cleaning kit stored in a trapdoor in the buttstock, with a cleaning rod running under the barrel, in the same style as the AK-47. The cap for the cleaning kit also serves as a cleaning rod guide, to protect the crown from being damaged during cleaning. The body of the cleaning kit serves as the cleaning rod handle. In common with some other Soviet-era designs, it trades some accuracy for ruggedness, reliability, ease of maintenance, ease of use, and low manufacturing cost. During World War II, many countries realized that existing rifles, such as the Mosin–Nagant, were too long and heavy and fired powerful cartridges that were effective in medium machine guns with a range in excess of 2,000 metres (2,200 yd), creating excessive recoil. These cartridges, such as the 8×57mm Mauser, .303 British, .30-06 Springfield, and 7.62×54mmR were effective in rifles to ranges of up to 1,000 metres (1,100 yards); however, it was noted that most firefights took place at maximum ranges of between 100 and 300 metres (110 and 330 yards). Only a highly trained specialist, such as a sniper, could employ the full-power rifle cartridge to its true potential. Both the Soviet Union and Germany realized this and designed new firearms for smaller, intermediate-power cartridges. The U.S. fielded an intermediate round in the .30 (7.62 mm) U.S., now known as the .30 Carbine; used in the M1 carbine, it was widely used by American forces in WWII but never replaced the .30-06 rifle cartridge. The German approach was the production of a series of intermediate cartridges and rifles in the interwar period, eventually developing the Maschinenkarabiner, or machine-carbine, which later evolved into the Sturmgewehr 44, which was produced in large numbers during the war, and chambered in the 7.92×33mm Kurzintermediate round. The Soviet Union type qualified a new intermediate round in 1943, at the same time it began to field the Mosin–NagantM44 carbine as a general issue small arm. However, the M44, which had a side-folding bayonet and shorter overall length, still fired the full-powered round of its predecessors. A small number of SKS rifles were tested on the front line in early 1945 against the Germans in World War II. Design-wise, the SKS relies on the AVS-36 (developed by the same designer, Simonov) to a point that some consider it a shortened AVS-36, stripped of select-fire capability and re-chambered for the 7.62×39mm cartridge. This viewpoint is problematic, as the AVS uses a sliding block bolt locking device, while the SKS employs a more reliable tilting-bolt design, an entirely different style. The bolt mechanism is one of the defining features of a rifle, having a different bolt means the SKS and AVS merely appear similar in layout, while differing vastly in bolt lockup, caliber, size, and that one has a fixed magazine and the other has a detachable magazine. It also owes a debt to the SVT-40 and M44 that it replaced, incorporating both the semi-automatic firepower of the SVT (albeit in a more manageable cartridge) and the carbine size and integral bayonet of the bolt-action M44. In 1949, the SKS was officially adopted into the Soviet Army, manufactured at the Tula Armory from 1949 until 1955 and the Izhevsk Mechanical Plant in 1953 and 1954. Although the quality of Soviet carbines manufactured at these state-run arsenals was quite high, its design was already obsolete compared to the Kalashnikov which was selective-fire, lighter, had three times the magazine capacity, and had the potential to be less labor-intensive to manufacture. Gradually over the next few years, AK-47 production increased until the extant SKS carbines in service were relegated primarily to non-infantry and to second-line troops. They remained in service in this fashion even as late as the 1980s, and possibly the early 1990s. To this day, the SKS carbine is used by some ceremonial Russian honor guards, much the same way the M14 Rifle is within the United States; it is far less ubiquitous than the AK-47 but both original Soviet SKS rifles and copies can still be found today in civilian hands as well as in the hands of third-world militias and insurgent groups. The SKS was to be a gap-filling firearm manufactured using the proven operating mechanism design of the 14.5×114mmPTRS-41 anti-tank rifle and using proven milled forging manufacturing techniques. This was to provide a fallback for the radically new and experimental design of the AK-47, in the event that the AK proved to be a failure. In fact, the original stamped receiver AK-47 had to be quickly redesigned to use a milled receiver which delayed production, and extended the SKS carbine’s service life. 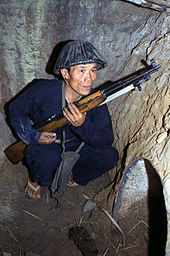 A guerilla of the People’s Liberation Armed Forces of South Vietnam, crouching in an underground tunnel, holding an SKS carbine. Almost as soon as the SKS was brought into service in 1949, it was rendered obsolete for Soviet purposes by the new AK-47, which was adopted by the Soviet military later that year. However, it found a long second life in the service of other Soviet-aligned countries, in particular the Chinese army, who found it well suited to their own style of warfare, the “People’s War” whose main actors were highly mobile, self-reliant guerrilla bands and rural militias protecting their own villages. In the philosophy of “the People’s War”, the emphasis was on long-range sniping, spoiling attacks, and ambushes. For this the Chinese army preferred its own domestic version of the SKS (the Type 56 carbine) to the AK pattern. From its introduction in 1956, the Type 56/SKS remained the workhorse of the People’s Liberation Army (PLA) for 30 years. In 1968, the army was briefly re-equipped with the unsuccessful Type 63 assault rifle, which had been intended to combine the sustained firepower of China’s first AK-47 variant (confusingly called the “Type 56 assault rifle“) with the precise semi-automatic fire of the SKS/Type 56 carbine and replace both of those separate rifles. However, by the mid-1970s, all manner of problems were plaguing the unreliable Type 63 rifle. Troops clamored to be given back their carbines, which had been redistributed to local militia units, and the army staff abandoned the Type 63 and returned the Type 56 carbine (SKS) and Type 56 assault rifle (AK-47) back into service. The standard practice was for squad leaders and assistant squad leaders to carry an assault rifle and for most other soldiers to carry a carbine, so that a front-line infantry squad fielded two assault rifles, two light machine guns, and seven carbines. However, after the beginning of China’s 1979 border war with Vietnam, Chinese combat units found that the SKS carbine’s capacity for long-range precision fire was of little use in the mountain jungles of the border region; as a result those units were hastily re-equipped with assault rifles. Guns of the AK family (including both the Chinese army’s Type 56 auto and the Vietnamese army’s AK-47s and AKM) are for structural reasons relatively inaccurate, and because the Chinese army has historically favored precision fire (despite generally having firearms ill-suited to that task), the Sino-Vietnamese war directly hastened development of the PLA’s Type 81 assault rifle. By the time border conflict broke out again between China and Vietnam in 1983, the Chinese military had already been completely re-equipped with their more accurate, precise Type 81 assault rifle. However the Type 56 carbine still remains in service with Chinese militias and reserve forces. The Type 56 also is in front line use as a drill and ceremony rifle. Many surplus SKS rifles were disposed of in the 1990s, and photographs and stories exist of SKS rifles used by guerrilla fighters in Bosnia, Somalia and throughout Africa and Southeast Asia during the 1990s and well into the 21st century. Several African, Asian, and Middle Eastern armies still use the SKS. During the Cold War, the Soviet Union shared the SKS design and manufacturing details with its allies, and as a result, many variants of the SKS exist. Some variants use gas port controls, flip-up night sights, and prominent, muzzle-mounted grenade launchers (Yugoslav M59/66, possibly North Korean Type 63). In total, SKS rifles were manufactured by the Soviet Union, China, Yugoslavia, Albania, North Korea, North Vietnam, East Germany (Kar. S) and (Model 56) in Romania. Physically, all are very similar, although the NATO-specification 22mm grenade launcher of the Yugoslav version, and the more encompassing stock of the Albanian version are visually distinctive. Many smaller parts, most notably the sights and charging handles, were unique to different national production runs. A small quantity of SKS carbines manufactured in 1955–56 was produced in China with Russian parts, presumably as part of a technology sharing arrangement. The vast majority of Yugoslav M59 and M59/66s have elm, walnut and beech stocks. Russian SKS’s had stocks of Arctic Birch (or “Russian Birch”), and the Chinese were of Catalpa wood (“Chu wood”). SKS carbines have also made appearances in recent conflicts in Africa, Afghanistan, and Iraq. Today, the SKS is in service with Cambodia, Laos, China, North Korea and Vietnam, as well as many other countries in Africa. SKS rifles have been seen in the hands of pro-Ukrainian forces in eastern Ukraine as of May 2014. After World War II, the SKS design was licensed or sold to a number of the Soviet Union’s allies, including China, Yugoslavia, Albania, North Korea, North Vietnam, East Germany, Romania and Poland. Most of these nations produced nearly identical variants, with the most common modifications being differing styles of bayonets and the 22 mm rifle grenade launcher commonly seen on Yugoslavian models. Variations (1949–1958): Early Spike-style bayonet (1949) instead of blade-style. Spring-return firing pin was present on early models, and they did not have chrome bores (1949 – early 1951). The gas block had three changes: The first production stage gas block, used from 1949 through early 1950, was squared-off at a 90-degree angle. The second gas block production stage was instead cut at a 45-degree angle, seen on late 1950 to 1951 rifles. The third and final gas block stage, from 1952 through to 1956, was curved inward slightly toward the action. Honor Guard: All-chrome metal parts, with a lighter-colored wood stock. OP-SKS. Many military surplus Soviet SKS were converted into hunting rifles by the Molot (“Hammer”) factory in Vyatskiye Polyany (Russian: Вятско-Полянский машиностроительный завод «Молот»)(English:Vyatskiye_Polyany_Machine-Building_Plant); these were labeled OP (OP = охотничье-промысловый, “commercial hunting (carbine)”). The OP-SKS continued to be manufactured into the 2000s. Chinese Type 56 semi-automatic carbine (Chinese SKS). Type 56 (1956–): Numerous minor tweaks, including lack of milling on the bolt carrier, partially or fully stamped (as opposed to milled) receivers, and differing types of thumb rest on the take down lever. The Chinese continually revised the SKS manufacturing process, so variation can be seen even between two examples from the same factory. All of the Type 56 carbine rifles have been removed from military service, except a few being used for ceremonial purposes and by local Chinese Militias. Type 56 carbines with serial numbers below 9,000,000 have the Russian-style blade-type folding bayonet, while those 9,000,000 and higher have a “spike” type folding bayonet. Some early examples are known as “Sino-Soviet”, meaning they were produced by China, but with cooperation from Russian “advisers” who helped regulate the factories and provided the design specifications and perhaps even Soviet-manufactured parts. Experimental stamped receiver: Very rare. A small number of Type 56 SKS rifles were manufactured with experimental stamped sheet metal receivers as a cost and weight saving measure but did not enter large scale production. Honor Guard: Mostly, but not all, chromed metal parts. Does not generally have the lighter-colored stock as the Soviet Honor Guard variant. Type 63, 68, 73, 81, 84: these rifles shared features from several east-bloc rifles (SKS, AK-47, Dragunov). AK-47 style rotary bolt and detachable magazine. The Type 68 featured a stamped sheet-steel receiver. The Type 81 is an upgraded Type 68 with a three-round burst capability, some of which (Type 81-1) have a folding stock. The Type 84 (known as an SKK) returns to semi-auto fire only, is modified to accept AK-47 magazines, and has a shorter 16″ paratrooper barrel. Commercial production: Blonde wood (“Chu wood”/”Qiu wood”) stock instead of dark wood, spike bayonet instead of blade, bayonet retaining bolt replaced with a rivet. Sub-variants include the M21, “Cowboy’s Companion”, Hunter, Models D/M, Paratrooper, Sharpshooter, and Sporter. Model D rifles used military style stocks and had bayonet lugs (although some were imported eliminated bayonet, and some examples eliminated the lug in order to meet changing US import restrictions). Model M rifles had no bayonet lug and used either a thumb hole or Monte Carlo–style stock. Both Model D and M used AK-47 magazines and as a result had no bolt hold open feature on the rifle. Romanian M56: Produced between 1957 and 1960. Typically nearly identical to the late Soviet model. Polish SKS (ksS): Refurbished Soviet rifles. Polish laminated stocks lack storage area in back of stock for cleaning kit. A few hundred SKS’s were given to Poland by the Soviet Union around 1954. While never adopted for use by combat units, the SKS is still in use in ceremonial units of the Polish Army, Air Force, Navy where they replaced SVT rifles. Honor guards of the Polish Police and Border Guard also use SKS carbines. In Polish service they are known as ksSwhich stands for karabin samopowtarzalny Simonowa, Simonov’s semi-automatic rifle. These rifles since have been slowly replaced by the new Polish rifle design, the MSBS. Yugoslavian PAP M59: Manufactured by Zastava Arms between 1959 and 1966. Barrel is not chrome-lined. PAP stands for “Polu-automatska puška” (Semi-automatic rifle) and the rifle was nicknamed “Papovka”. Otherwise this rifle is nearly identical to the Soviet version. Many were converted to the M59/66 variant during refurbishment. Yugoslavian PAP M59/66: Produced between 1967 and 1989. Added 22 mm rifle grenade launcher which appears visually like a flash suppressor or muzzle brake on the end of the barrel. Front sight has a fold-up “ladder” for use in grenade sighting. When the grenade sight is raised, the gas system is automatically blocked and the action must be manually cycled—rifle grenades must be fired with special blank cartridges, and this feature helps ensure that the gas pressure is not wasted on cycling the action. The gas system is not automatically unblocked when the sight is folded, however, and must be manually opened to again allow semi-automatic operation. Barrel was not chrome-lined. Both the grenade launcher and grenade sight are NATO spec. Stock is typically made from beech wood. Albanian “July 10 Rifle”: Produced between 1967 and 1978. There were no rifles produced from 1972 to 1975. Produced by the UM GRAMSH factory located in Gramsh, Albania. Longer stock and handguard on the gas tube, and AK style charging handle. The magazine is slightly different in the shape visible from the outside. The stock has two compartments with two corresponding holes in the buttplate for cleaning implements instead of the single cleaning kit pocket. Like the Chinese Type 56 carbine, the Albanian version also features a spike bayonet fixed beneath the muzzle. East German Karabiner-S: Extremely rare. Slot cut into back of stock for pull-through sling, similar to the slot in a Karabiner 98k. No storage area in back of stock or storage for cleaning rod under barrel. North Korean Type 63: Extremely rare. At least three separate models were made. One “standard” model with blade bayonet, and a second with a gas shutoff and a grenade launcher, similar to the M59/66. The North Korean grenade launcher was detachable from the muzzle and the gas shutoff was different from the Yugoslavian model, however.A third model appears to have side-swinging bayonet. Vietnamese Type 1: Extremely rare. Nearly identical to both the Soviet and Sino-Soviet SKS. These are identified by a small star on the receiver with a 1 in the center. The barrel is chromed, as are many of the internal parts. It is unknown currently whether there are spiked bayonets or only bladed. The stock work is identical to more common SKS variants such as the Soviet and Chinese. These appear to have been either converted Soviet or Sino-Soviet models, or simply cloned from these rifles. There is some debate as to the relative manufacturing quality of each nation’s SKS production. The Chinese SKSs varied significantly even among new rifles with some having screwed in barrels, milled trigger groups and bolt carriers with lightening reliefs cut into them being at the top end and cheaper rifles having pinned barrels, stamped trigger groups and slab-sided bolt carriers – though overall quality and serviceability remained high. The main reason for the manufacturing variance comes from differences between rifles made for the Chinese army and those made for export. The Chinese types typically have chrome-lined barrels while the Yugoslav versions do not, resulting in some Yugoslavian carbines having bores in considerably worse condition than even the cheapest Chinese SKSs. The Yugo M59/66 rifles also are unique in having a gas shut off valve for grenade launching, which is a common source of malfunctions. While often encountered in well-used condition, Romanian carbines were as well-built as the Soviet versions. In general, carbines made in the USSR are considered the highest quality. The interchangeability of many parts has resulted in carbines on the U.S. market that are a mixture of different parts of varying quality, sometimes including parts from different countries, often with non-standard after-market parts. Such rifles are usually referred to as “parts guns” and are generally considered the least-desirable carbines encountered. Even so, they are significantly cheaper than comparable semi-automatic rifles and can be expected to offer reliable performance. North Korean, Vietnamese, East German, and Albanian SKSs bring a higher price than those of other countries. Soviet and Romanian carbines have largely reached price parity, with Chinese carbines somewhat lower in price. The stock on the Albanian versions is of a slightly different manufacture and these were made in low production numbers. There were approximately 18,000 Albanian SKSs manufactured during the late 1960s until 1978, and of those, approximately half were destroyed. Most of the remaining East German SKSs had been sold/transferred to Croatia in the early 1990s. This article may be expanded with text translated from the corresponding article in Russian. (February 2016) Click [show] for important translation instructions. The following table lists accuracy statistics for an SKS rifle firing 57-N-231 steel core service ammunition. The statistics were computed under the Russian method for determining accuracy, which is more complex than Western methods which usually involve firing a group of shots and then measuring the overall diameter of the group. The Russian method differs in that after a group of shots is fired into the target, two circles are drawn, one for the maximum vertical dispersion of hits and one for the maximum horizontal dispersion of hits. Hits on the outer part of the target are disregarded, while only half of the hits on the inner part of the circles are counted (50% or R50), which significantly reduces the overall diameter of the groups. The vertical and horizontal measurements of the reduced groups are then used to measure accuracy. This circular error probable method used by the Russian and other European militaries cannot be converted and is not comparable to US military methods for determining rifle accuracy. When the R50 results are doubled the hit probability increases to 93.7%. In general, this is an improvement with respect to firing accuracy to the AK-47 and the AKM. The vertical and horizontal mean (R50) deviations with service ammunition at 800 m (875 yd) for AK platforms are. In the more than 70 years of use worldwide, the SKS has seen use in conflicts all over the world. Kosovo War (Used by the Kosovo Liberation Army in the war. PLAN sailors at Qingdao, North Sea Fleet HQ, parading with Chinese Type 56 carbines. Soldiers of Vietnam People’s Army with SKS carbines. 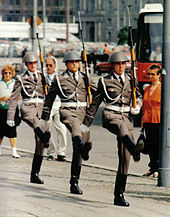 East German Honor Guard in front of the Neue Wache in Berlin on Unter den Lindenwith SKS carbines. Croatia Limited to ceremonial purposes. Slovenia Limited to ceremonial purposes. Vietnam Limited to ceremonial purposes. The SKS is popular on the civilian surplus market, especially in Canada and the United States. Because of their historic and novel nature, Soviet and European SKS carbines are classified by the BATF as “Curio & Relic” items under U.S. law, allowing them to be sold with features that might otherwise be restricted. Chinese manufactured rifles, even the rare early “Sino-Soviet” examples, are not so classified, though the “Sino-Soviet” rifles qualify for automatic Curio & Relic status due to being manufactured over 50 years ago. Because of the massive size of the Chinese People’s Liberation Army, over 8 million Chinese SKS rifles were manufactured during their 20 years of use making the Chinese SKS one of the most mass-produced military rifles of all time although still far behind its successor the AK-47. In Canada, the large flux of imported SKS rifles has driven prices down to around $200–$300 per Russian SKS. The Chinese Norinco SKS can be bought for slightly less. As with most military surplus rifles, they are coated in cosmoline for the preservation of the firearm while under storage for decades at a time. Along with a large supply of bulk 7.62×39mm surplus ammunition, SKS rifles have become a popular firearm for civilian ownership. In Australia, the Chinese SKS rifle (along with the Soviet SKS rifle) was very popular with recreational hunters and target shooters during the 1980s and early 1990s before semi-automatic rifles were restricted from legal ownership in 1996. Since the introduction of the 1996 gun restrictions in Australia, the Mosin–Nagant series of bolt-action rifles and carbines have now filled the void created when the SKS was restricted from legal ownership. A sporterized SKS carbine fitted with an aftermarket composite stock and weaver rail. In the early 1990s, the Chinese SKS rapidly became the “poor man’s deer rifle” in the United States due to its low price, lower even than such old favorites in that role as the Marlin 336. Importation of the Chinese SKS into the U.S.A. was banned in 1994. Due to its relatively low cost and widespread availability and usage, the SKS has spawned a growing market for both replacement parts and accessories. Many aftermarket parts are available to modify the carbine—sometimes so considerably that it bears little resemblance to the original firearm. This may include items such as synthetic stocks, pistol grips, higher capacity magazines, replacement receiver covers (to allow the mounting of scopes, lasers, etc. ), different muzzle brakes, recoil buffers, bipods, and more. The carbine’s integral 10-round magazine is not an issue in those states and nations which prohibit higher-capacity magazines, except Canada, and New Zealand. In the case for Canada, the SKS is classified as a non-restricted firearm and the magazine must be pinned to five rounds or the rifles must be retrofitted with five-shot magazines, while New Zealand’s arm code states that an A class center fire, self-loading rifle must have no more than seven rounds in the magazine (this only applies to guns on an a-cat licence, those on an e-cat have no magazine limit). Where higher capacity magazines are legally permitted, there are a number of secondary market vendors that sell higher capacity magazines of up to 30 rounds (or more). These secondary market magazines may be installed by first removing the fixed OEMmagazine (a process that involves the removal of the trigger group assembly with a pin punch, screwdriver, bullet-tip, or similar device). However, although the 7.62×39mm round is generally compared to the American Winchester .30-30, many states have laws against hunting rifles with magazines of more than five rounds. Magazine plugs limiting the magazine to five rounds must be used for hunting in these states. While aftermarket detachable magazines may be simple to install, doing so may be illegal under certain circumstances or even in some vicinities. They are also banned in Cook County, Illinois, which includes Chicago and many suburbs, although as of the 2010 McDonald v. Chicago US Supreme Court decision, the City of Chicago ordinance does not disallow removable magazines, creating a confusing situation for firearm owners. U.S.C. 922 (r), which regulates imported rifles with certain features the BATFE defines as not being suitable for sporting purposes requires seven “compliance parts” (out of a list of 20 possible parts) of U.S. manufacture to be installed on any modified SKS. Next Next post: Somebody has a nice piece for their collection!